Pain Physicians NY (Brooklyn, Queens, Manhattan, Bronx NYC) is one of the first practices in New York to offer an alternative treatment for shoulder pain. Depending on severity of the pain, signs and symptoms in addition to traditional treatment options such as muscle relaxants, injections or physical therapy we might offer a cutting edge, non-invasive disc decompression procedure and rich plasma (PRP) injections. A rotator cuff is a circular band of muscles and tendons that surround the shoulders. The role of these muscles and tendons is to keep the top of the arm in the shoulder socket, in a firm position. Rotator cuff injuries occur mostly due to repeated movements of the hands and shoulder over the head, like while working or training a sport. Some people are at a greater risk suffering from a rotator cuff injury than others. Rotator cuff injuries are common among carpenters, painters, tennis players, baseball players, etc. Rotator cuff injuries tend to run in the families, so it is believed that genetics also plays an important role. The risk of an injury of the rotator cuff increases as we get older. Rotator cuff injuries result from repetitive actions that require the movement of the arms and shoulder over the head, lifting heavy things for a prolonged period of times as well as from any progressive degeneration of the tendons which will lead to a wear and tear of the muscle tendons of the rotator cuff. Rotator cuff injuries can also occur from a single injury. Extensive rotator cuff injuries may require surgical treatment, during which a repair and transfer of the alternative tendons or even a joint replacement is performed. Difficulties performing everyday tasks like dressing up, reaching your back, combing your hair, etc. Rotator cuff injuries are diagnosed through a detailed medical history and anamnesis, physical examination of the affected arm and shoulder, accompanied also with imaging test and examination like X-rays, Ultrasound, and MRI scans. Resting the affected arm after an injury is recommended, along with an application of ice packs and physical therapy. Sometimes that is enough for the treatment of a rotator cuff injury. Although resting the affected arm and shoulder is necessary, sometimes too much rest can just make it worse. Immobilization for a prolonged period of time can sometimes lead to frozen shoulder, a medical condition characterized by a thickening and tightening of the shoulder joint. However, in more severe cases when the damage of the muscles and tendons is greater, other treatment methods are necessary, sometimes even surgery. Corticosteroid injections on the affected joint are often necessary when the pain is severe and can’t be controlled with over the counter painkillers. They should be used with a good percussion as they can also weaken the muscle tendons. Physical therapy plays an important role in the treatment of rotator cuff injuries as they can help strengthen the muscles as well as restore the flexibility and the movement range of the affected arm and shoulder. Surgery is the last treatment option when other treatment methods have failed to relieve the signs and symptoms of rotator cuff injuries. 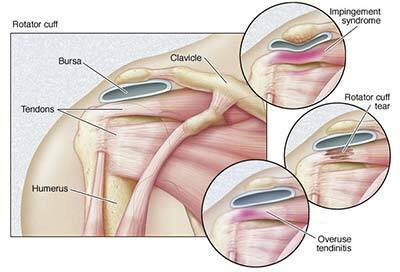 Surgery is also necessary when there is an excessive damage of the tendons and muscles of the rotator cuff. Different surgical procedures are available like arthroscopic tendon repair, open tendon repair, bone spur removal, tendon transfer as well as a complete shoulder replacement. The most advanced pain management center, Brooklyn pain management doctors and specialists at Pain Physicians NY offer unique, individualized approach to manage your shoulder pain. We are using the most effective pain management and treatment options to treat rotator cuff injury, arm and hand pain, different forms of arthritis, trigger finger or thumb, frozen shoulder. We are utilizing the latest technologies available in USA.